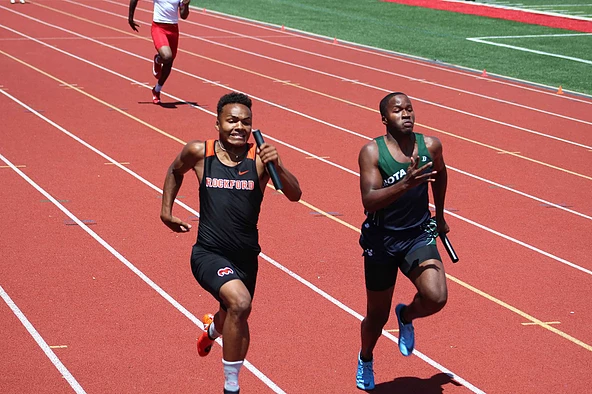 The Rockford boys track team took on the best in the state at the MHSAA Division 1 Boys Track & Field Finals at East Kentwood, Saturday, June 2. The Rams earned the honor of landing as the fifth best team in the state with 35 points. East Kentwood claimed the state crown with 61 points. Ann Arbor Pioneer claimed second with 39 points, and Saline and Grand Blanc ended in a tie for third with 37 points. Rounding out the top eight were Oak Park in sixth place with 30 points, and a tie for seventh between Traverse City Central and Birmingham Seaholm, both tallying 21 points. Ram senior Cole Johnson was able to claim the state titles in both the 800m and 1600m runs. Johnson was a running nightmare for Ann Arbor Pioneer. Johnson ran the 800m in a time of 1:53.11, just edging out Ann Arbor Pioneer’s Netunji Paige at 1:53.41. And, in the 1600m run, Johnson clocked in at 4:08.47 10, nosing out Ann Arbor Pioneer’s Nick Foster at 4:08.64. Junior Noah Stallworth finished fifth in the 100m clocking in at 10.80, and claimed eighth in the 200m run with a time of 22.43. Stallworth was also part of the 4X100 relay team, joining teammates Eli Haddad, Jason Whittaker, and Chase Novak, to place seventh with a time of 42.93. The 4X400 relay team of Jacob Rademacher, Nate Carlson, Chase Novak, and Cole Johnson also placed seventh with a time of 3:23.02. Senior Dayton Brown closed out his track high school career by placing 10th in the 3200m run with a time of 9:22.78. In the field events, Rockford saw senior Gavin McIntyre place fifth with a throw of 163’9”, and Chase Novak placed eighth in the long jump with a leap of 21’11.25”. In the pole vault, junior Logan Murphy found himself in a tie for 17th with a vault of 13’.